I want know all the possible options to buy train tickets in Indonesia (assuming you can buy them from different places). Is there any advantages when using one option or another? I'm Indonesian and I transport by train weekly. Now you can book your ticket easily via mobile application named KAI access (it's the official! ), from there you can choose all the schedule-train-and payment method, even more if you need food on train or porter to help you bring the luggage, you can book there too! At a train station. Obviously, this sounds like the best idea, but don't be fooled, you're in Indonesia and waiting times can be epic. Give it a try, if the queue is huge, just try another option listed below. At a local supermarket (Indomaret, Alfamart, or else). They almost all do it, & the price is the same as indicated on internet. The only challenge can be the language barrier with the employee, but it's usually easily overcame. After buying, you have a receipt with a train ticket code to print the train ticket at a machine at the train station. Online. http://www.kereta-api.co.id is the official website of the train network of Indonesia. You can see all the train times, but buying ticket seems difficult (impossible for foreign bank cards? ), although good to have an overview of timetable. http://www.kereta-api.co.id is only in Indonesian I believe, but with Google translate it was easy to use it. 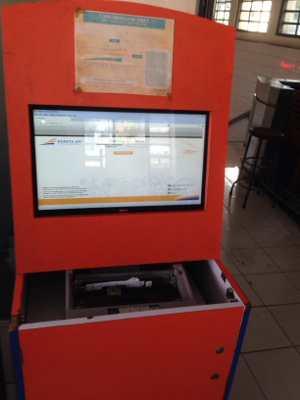 http://m.tiket.com is a reseller of train ticket for Indonesia (no extra fee), when buying, you then have a code to print your ticket at a machine at the train station. http://m.tiket.com is also in English, just change the language using the relevant link at the bottom of the page. I both bought from http://m.tiket.com and also from the local supermarkets, both worked very well. Just make sure you arrive a bit in advance at the train station (maybe 45min) to print out your ticket without too much stress. See the ticket machine below. This is the internet answer, I have no local knowledge at all. The site of the Man in Seat Sixty-One has this page about buying tickets in Indonesia. The site ticket.com does accept international credit cards, as does the site Mau Ke Mana, there is one more site on that same part of the page, the official railway page for Indonesia, but that seems often not to accept international credit cards. And there is the option of buying tickets at a railway station in Indonesia, as far as I understand you can do that at any station, also in advance. But as said, my only information is from internet. I've been travelling by train in Indonesia quite a few times. I've been buying train tickets for others as well in Indonesia. Buying tickets for trains and flights can often be a hassle in Indonesia. Often the train company (KAI) or the airlines offer tickets on their own websites, thereby advertising with credit card logos of MasterCard and Visa. Paying is often not a problem with an Indonesian debit or credit card. When using a foreign credit card, however, payment is often declined. My best experience is using reseller Traveloka for buying train tickets and airline tickets for airlines other then Garuda Indonesia and AirAsia. Yes, they take a small fee for selling you the ticket but I never had an issue obtaining a ticket with a foreign card. I have just confirmed the official website of Indonesia train ticket visit OFFICIAL WEBSITE, They accept the following payment method, , So, If you have any of the cards from above you can just try using the official website. Beside this there are many other private website which too helps in booking ticket, The basic difference between the option is, If you are directly buying from the official website, They will charge you the normal charges. Whereas, If you are booking through private website they may give you some discount but they also charge more money if deadline for the ticket is nearby in few weeks. I would suggest you to use the official website for booking ticket as there were will be no additional useless charge taken from you, If you are nearby deadline. There rules work based on the availability of seats, So, If they have seat you will get it when reaching the deadlines nearby in few weeks and if they won't have then they will not charge any additional charges or taking more money for just reserving the seat. If you have any other queries or problems feel free to ask again. Thank-You ! Not the answer you're looking for? Browse other questions tagged trains public-transport transportation indonesia night-transport or ask your own question. How to get to Yogyakarta from Cemoro Lawang? Can I leave Indonesia and use the same visa when I return?